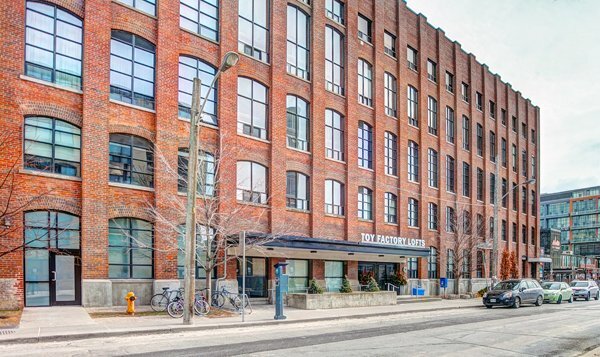 The Toy Factory Lofts is the only loft conversion in Liberty Village, the only remnant of the area’s industrial past kept for residential use. 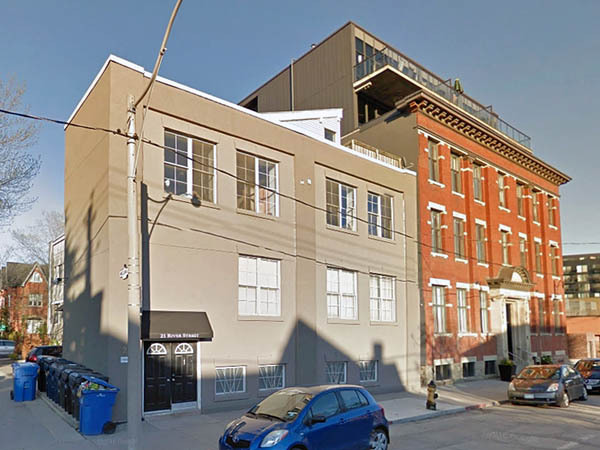 Yet another strangely named Toronto loft. While yes, Irwin Toys did use the big factory, they came after the Hinde and Dauch Paper Company out of Ohio. Who came after someone else. 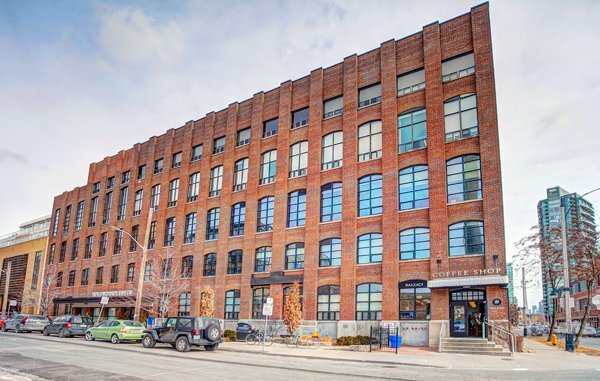 No matter the pedigree, the Toy Factory Lofts does an amazing job of preserving and rehabilitating a significant industrial structure in Liberty Village. 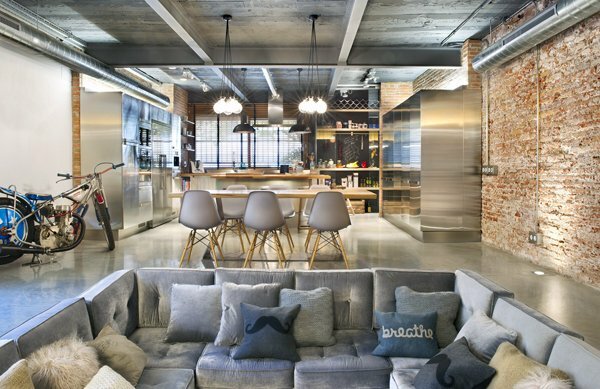 The origins of the old factory are somewhat clouded. Going through old Goad’s fire insurance maps, we can trace the building activity on the lot at the corner of Liberty Street and what was then called Pacific Avenue. I always find it so ironic that Liberty Street ran past the Mercer Reformatory (womens’ prison) to the Central Prison… “liberty” indeed! Aerial photo from the 1920s, one of the earliest shots of the area. Prison area would be to the east, out of frame. The Ex is on the right, to the south. The 1890 map shows the lot to be empty, but 1893 has a whole bunch of structures. 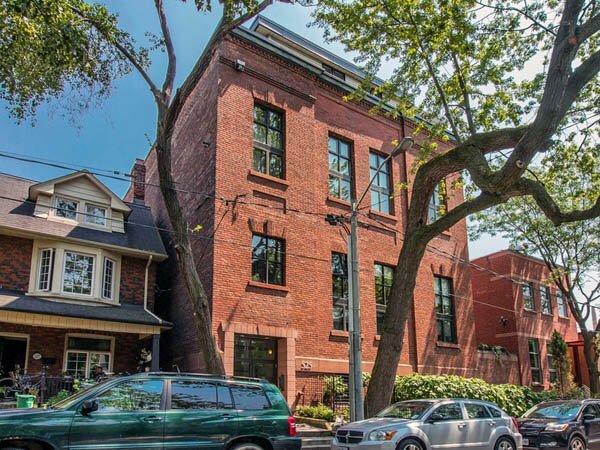 A couple certainly look like factories, but then there is a row fronting Pacific that could be construed as houses. The 1899 map shows very similar buildings, with some additions – which look to be unchanged in 1903. And then in 1910 it all changes. 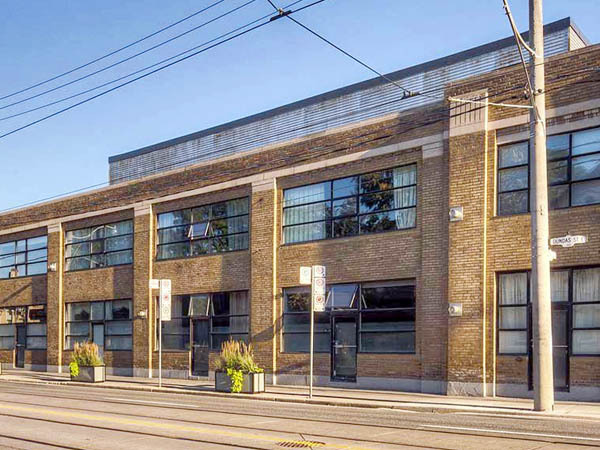 Pacific Avenue is changed to Hanna Avenue and Hinde and Dauch buys the extant facility. 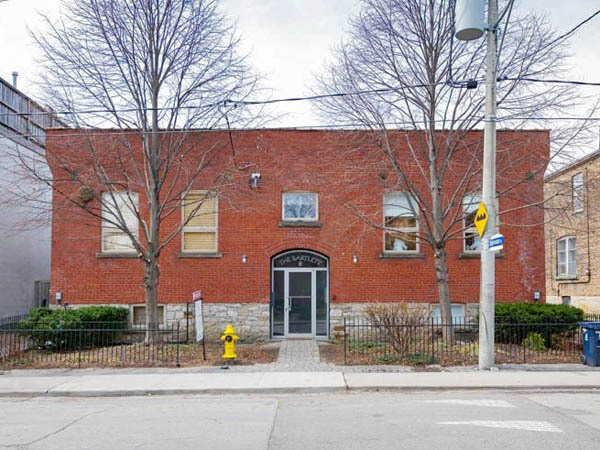 Company records suggest they bought a machinery shop on Sudbury Street in 1909 and then the Hanna Ave. facility a year later. But they do not identify what it was previously. 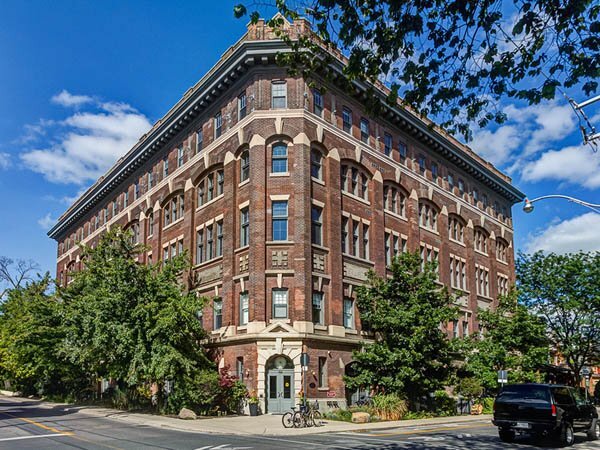 So Hinde and Dauch moved there in 1910, but they did not build it, as the original buildings were there in 1893, expanded a little before 1899 then stayed like that until some point between 1913 and 1924. 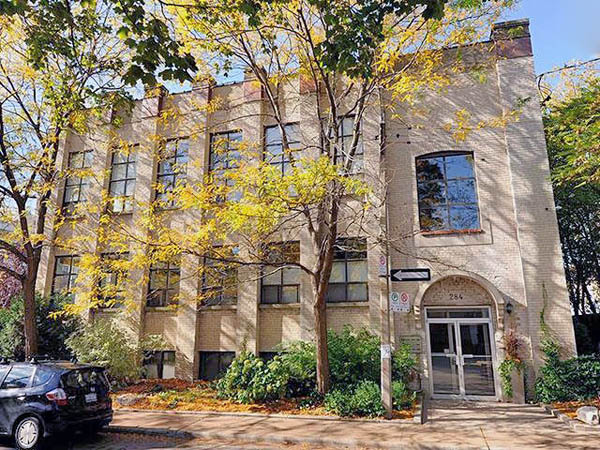 It was prior to 1924 that expansions were made and the current layout of buildings came about. Which makes a lot of sense, as their business was starting to rapidly expand in the 1920s. But it was Irwin Toy’s presence in the complex for the latter half of the 20th century that left the most lasting impression. 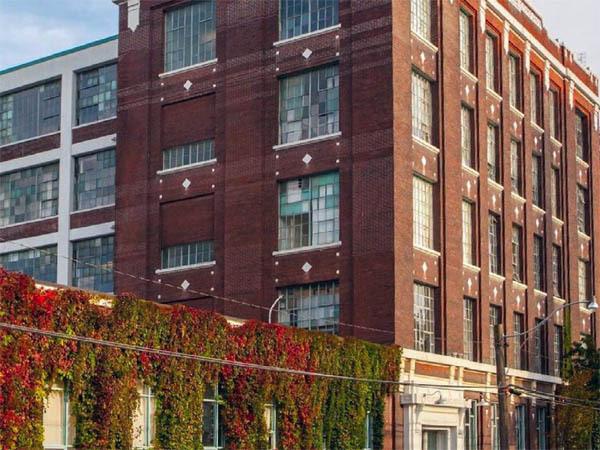 The Toy Factory Lofts transformed the old Irwin Toy warehouse and offices into 215 hard lofts with 220 parking spaces. 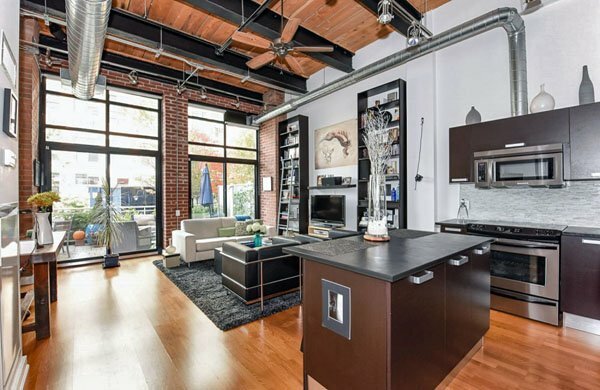 The oldest parts of the building still show the old brick walls that are several feet thick, and the steel ceiling beams combined with solid Douglas fir posts. 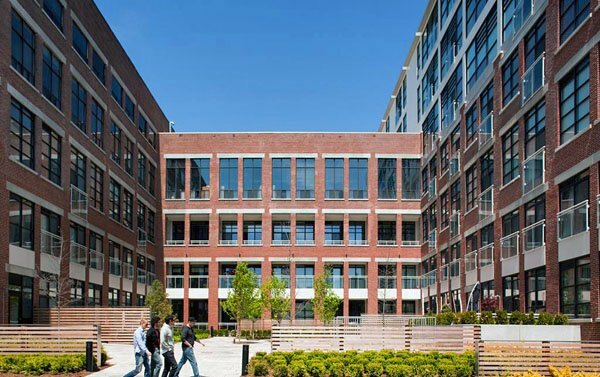 With a creative blend of renovation, reconstruction and expansion, the rehabilitation of the old paper mill and toy warehouse combines live/work units with a couple of office components and a single retail outlet. 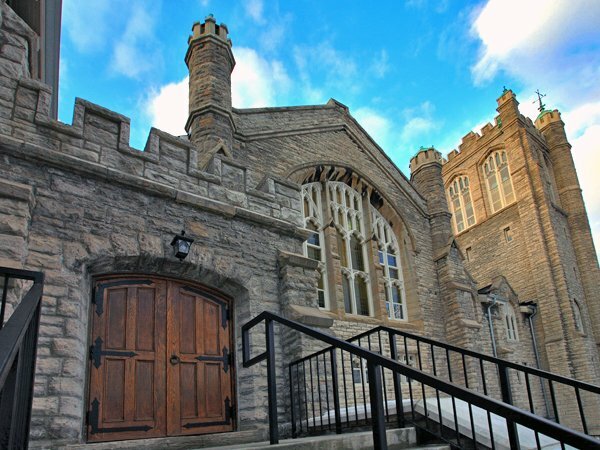 It remains a well-known landmark structure in an area of Toronto undergoing dramatic revitalization. 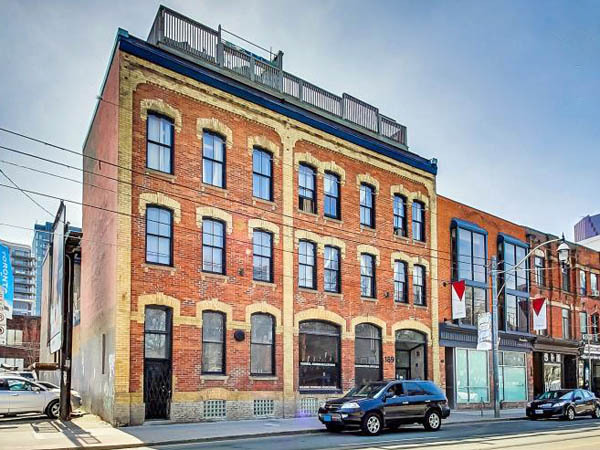 Yet, oddly enough, The Toy Factory Lofts is the only loft conversion in in Liberty Village. 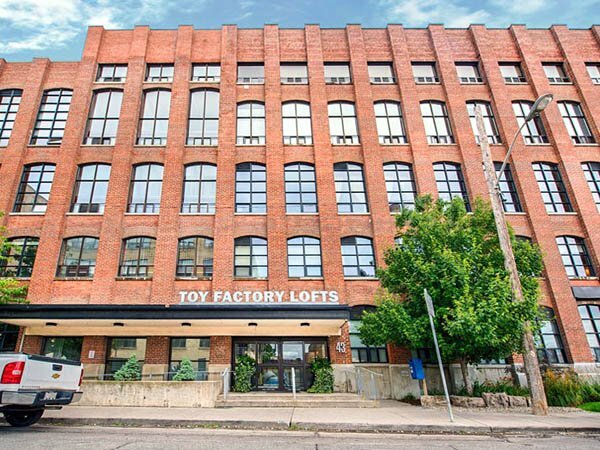 The Toy Factory is also very well-known for their extremely low condo fees. 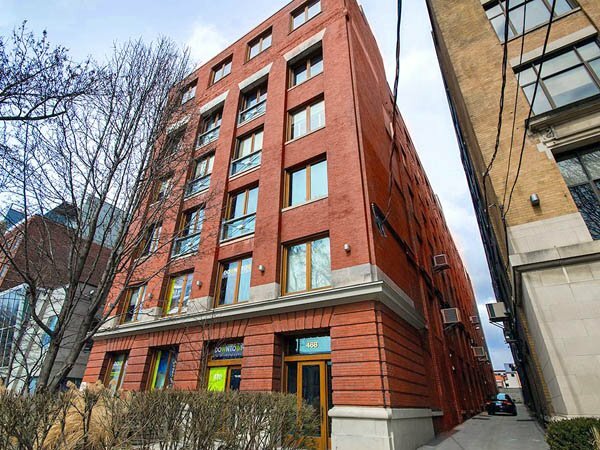 All property managers should take lessons from them on how to properly run a condo corporation. 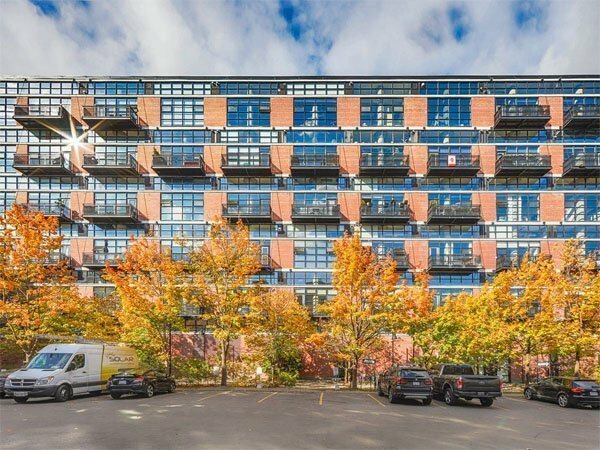 A large building with over 200 units and more than 200 parking spaces, full-time concierge, lots of amenities… and yet they can reduce fees some years. 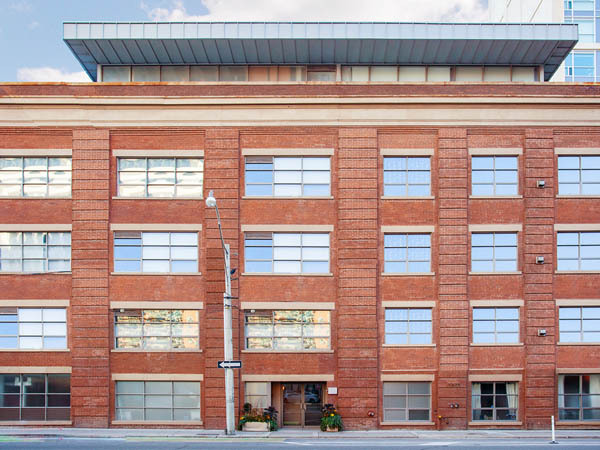 The majority of the lofts are carved from original buildings, but there is a 3-storey addition on the triangular building that contains some newer soft loft style units. 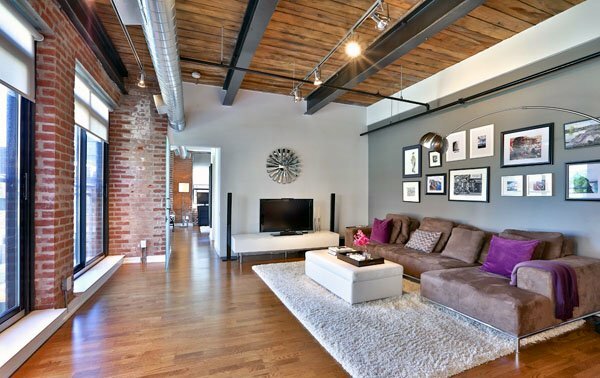 The vintage lofts have amazing exposed brick walls and gorgeous wood ceilings with massive steel beams, concrete floors and lots of track lighting on the high ceilings. 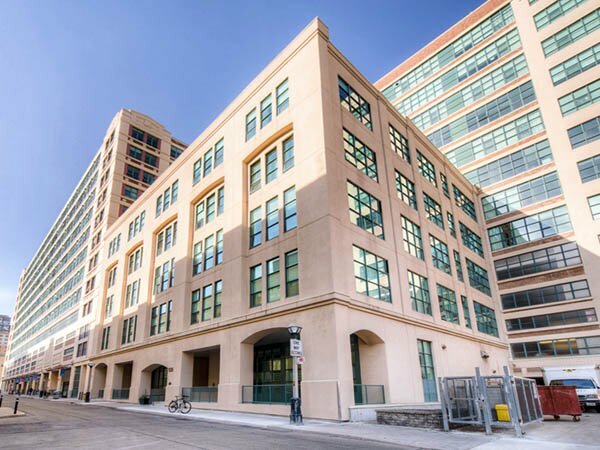 The building features 24-hour concierge, an outdoor hot tub, large gym, visitor suites and visitor parking. 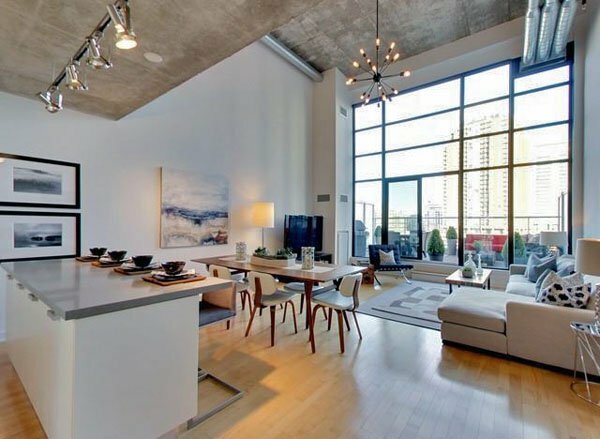 The lofts range from just under 700 square feet to just over 3,000 square feet, but most are in the 750-1,500sf range. 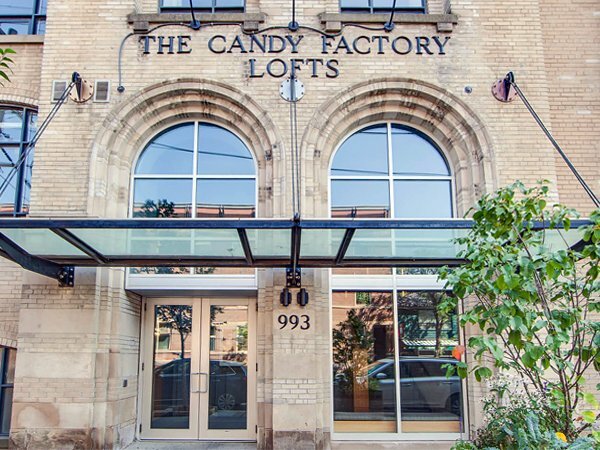 The Toy Factory Lofts is a huge building with many different wings and different elevators to get you around. 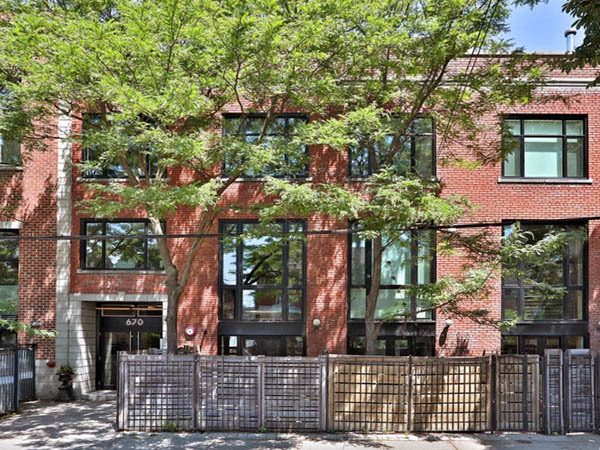 The new units have balconies, and a few of the vintage units on the south side do as well. Just for fun, the floor plans were all named after games! And there is a Balzac’s coffee right in the building! 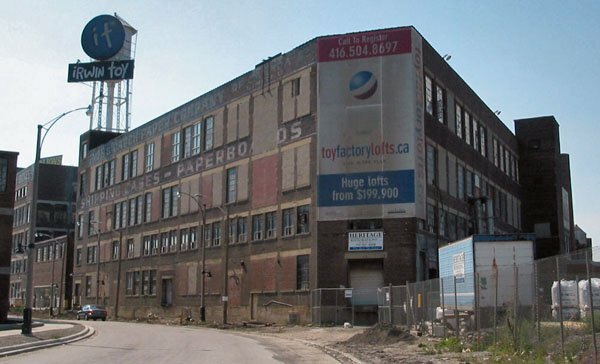 The old paper mill at 43 Hanna Avenue was added to the City of Toronto Inventory of Heritage Properties in 2004. 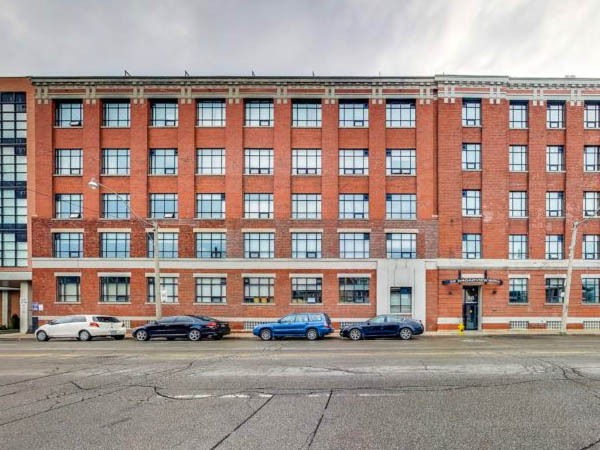 And the little brick building directly north of the Toy Factory parking, at the corner of Hanna & Snooker Ave, is the old power plant for the Hinde and Dauch Paper Company, and is also designated heritage. 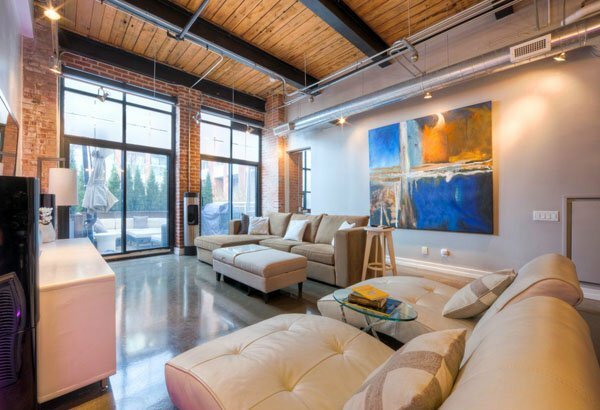 The old factory structure was constructed in stages in the early 20th century in what was originally a heavily industrialized zone west of Toronto’s downtown core. 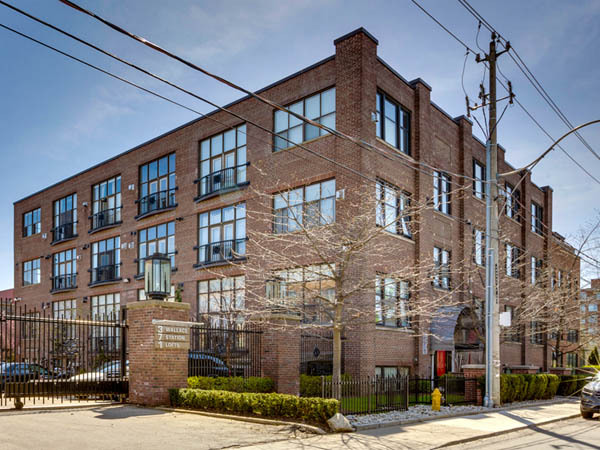 The site sits at the eastern edge of the existing Liberty Village community, adjacent to new residential and “big box” retail developments. 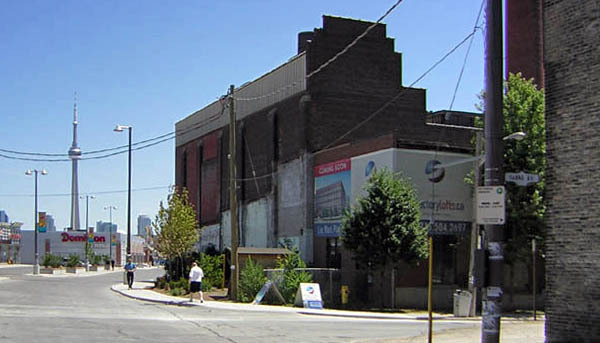 Associated during the 20th century with the Hinde and Dauch Paper Company and Irwin Toy Limited, the site is an integral part of the former industrial enclave developed southeast of King Street West and Dufferin Street, and is linked to its surroundings where many of the neighbouring industrial complexes are recognized on the City of Toronto’s heritage inventory. James J. Hinde was born in Huron Township, Ohio in 1855. Jacob J. Dauch was also born in Huron Township, just two years later in 1857. 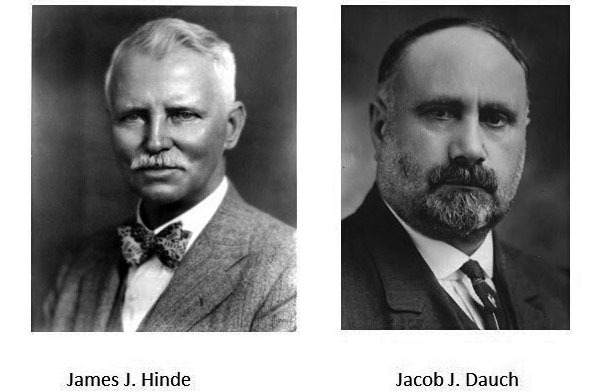 In 1888, Hinde and Dauch formed a partnership to harvest and bale straw to be used in paper making. One of their customers was the Sandusky Paper Mill, which made butcher wrapping paper from straw. The paper mill ran into financial difficulty, and after leasing it for a time, in 1892 Mr. Hinde and Mr. Dauch purchased the mill. 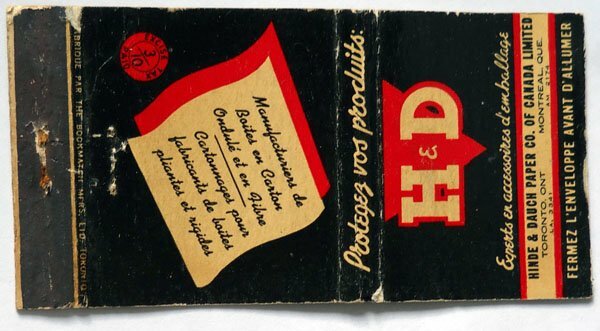 The company eventually became known as the Hinde and Dauch Paper Company. In its early years, the business was not very profitable. 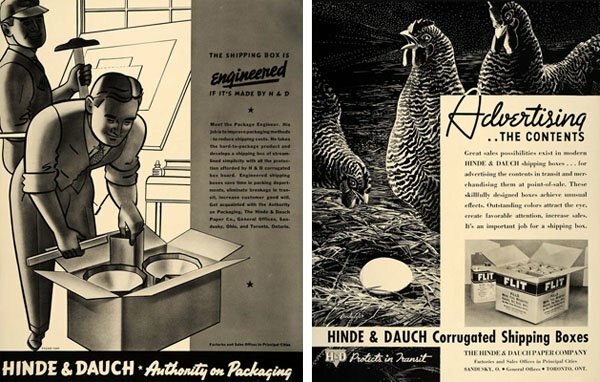 After developing corrugated paper, Hinde and Dauch Paper became a leading company in its field. 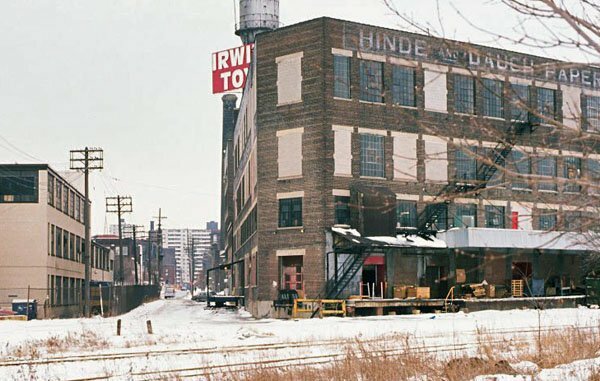 Eventually the Hinde and Dauch Company became the largest manufacturer of its kind in the United States. There were box factories in several cities of the U.S. and Canada, and paper mills as far west as Iowa. In 1905, the Diamond Flint Glass Company of Toronto began importing corrugated boxes from H & D in the U.S. to package the fruit jars they made. The 35% import duty became onerous to Diamond Flint’s management and they prevailed upon H & D to start a Canadian operation. 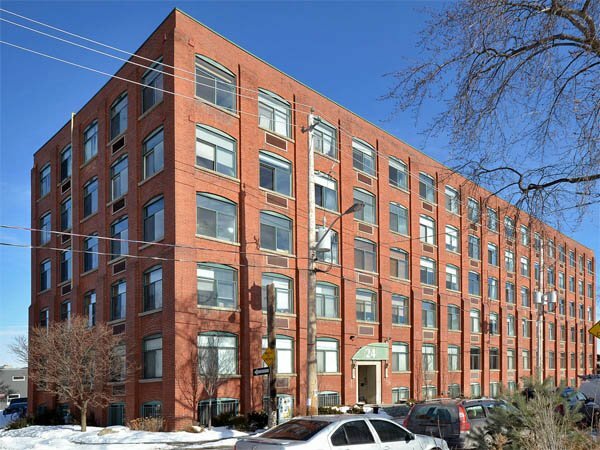 In 1909, the Hinde and Dauch Paper Co. of Canada was established in a former machine shop on Sudbury Street in Toronto, with a staff of ten men operating a forty-inch corrugating machine with ancillary slotting, scoring and printing equipment. 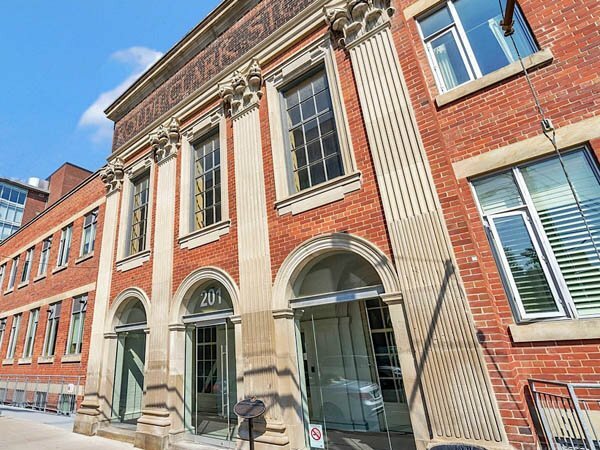 A year later the company moved to a larger building on Hanna Avenue in Toronto and added equipment to produce solid-fibre boxes. About three years later the company installed a forty ton per day board machine (which jibes with the evolution of the buildings seen on the fire maps). Business kept growing and in 1927 H & D of Canada built a mill in Trenton, Ontario to produce straw-board corrugating medium. 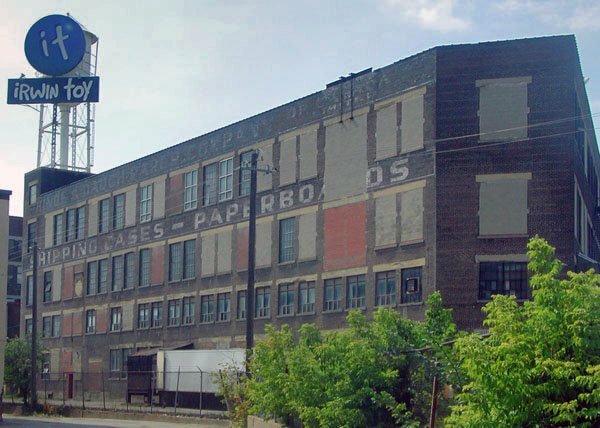 In 1928, the Canadian company acquired two additional corrugating plants, one in Montreal and one in Toronto (I wonder where this factory was), as part of the U.S. patent firm’s acquisition of Thompson and Norris Co. 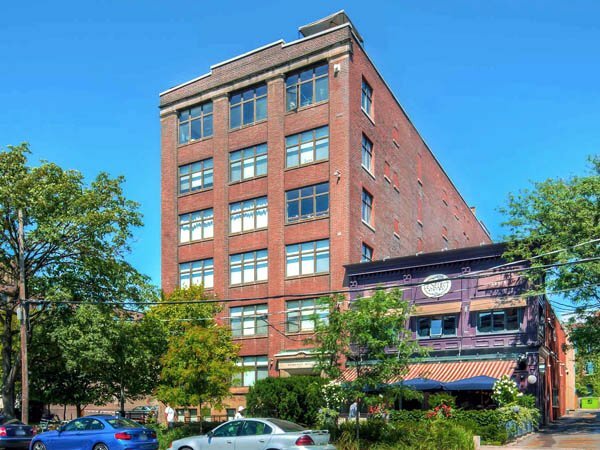 This expansion, in turn, led to the necessity for further linerboard production capacity and, in 1929, a second cylinder board machine was installed in the Hanna Ave. location. In 1953, the West Virginia Pulp and Paper Co. (known as Westvaco) acquired control of the parent Hinde and Dauch company in the United States. 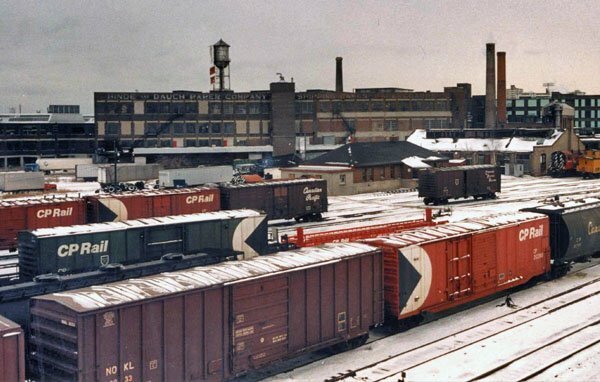 Under Westvaco, H & D in Canada continued to expand, acquiring the Peterborough plant of Martln-Hewitt in 1953 and purchasing Corrugated Paper Box Company Ltd. in 1954., with its folding carton plant in Leaside and the subsidiary Hilton Brothers corrugated plants In Winnipeg and Calgary. 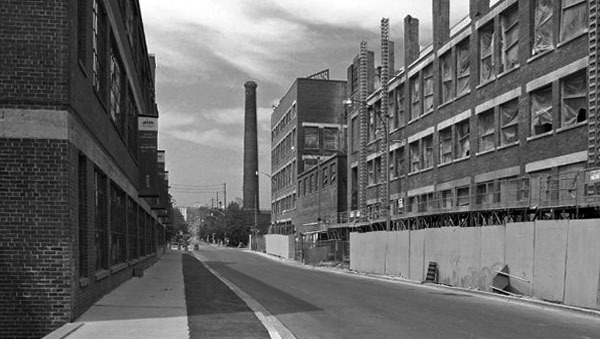 The new Etobicoke plant was completed in 1955 and the St. Marys plant in 1958, following the cessation of corrugating operations in Chatham. 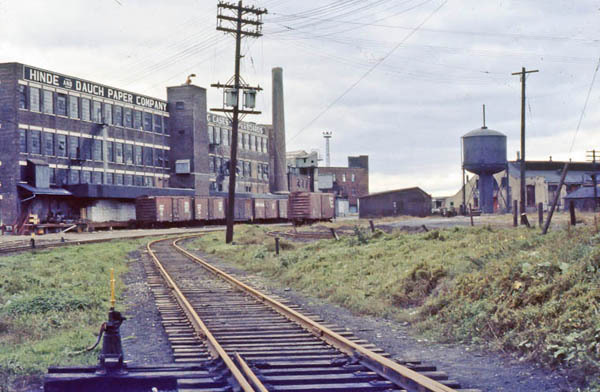 In 1959, control of the Canadian H & D operations was purchased from Westvaco by St. Lawrence Corporation, a Canadian company and one of the major producers of pulp and paper products in North America. 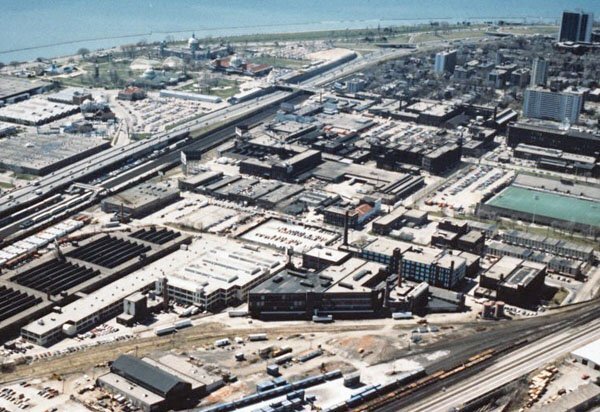 Shortly after, St. Lawrence became part of the Domtar corporate structure and the H & D converting facilities formed the basis for what is now the Corrugated Containers Division of Domtar Packaging Limited. Growth has continued under the Domtar regime with the building of new plants in Moncton, N. B. and Quebec City, the acquisition of the Superior Box Co. corrugating plant in Kitchener, Ontario, and the re-activation of the former Carton Specialties folding box plant in Leaside as a corrugated box facility. With the manufacturing plants covering the country from Moncton, N.B. to Calgary, Alberta, Domtar’s Corrugated Containers Division is the largest corrugated paperboard supplier in Canada. N.B. 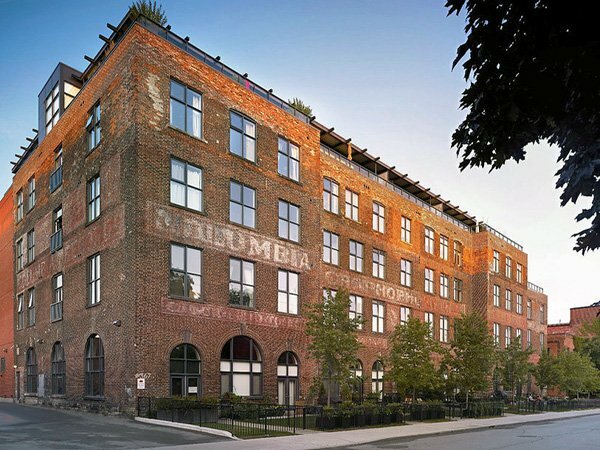 What’s really cool is that the original Hinde and Dauch Paper Company factory in Sandusky OH was also converted to lofts, the Chesapeake Lofts. So where are the toys, you ask? 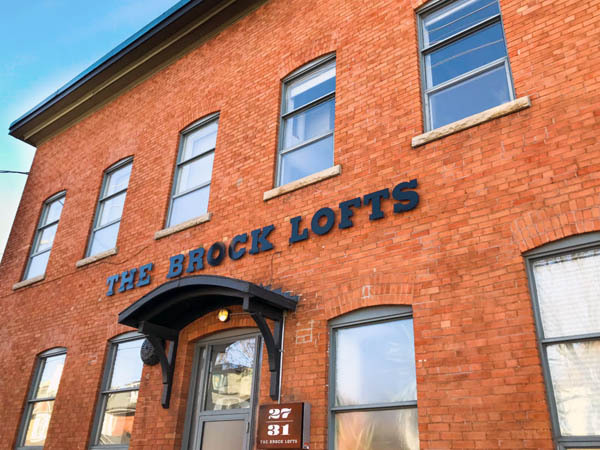 Well, we have traced the lofts’ provenance from construction sometime in the early 1890s through to Hinde and Dauch buying the property in 1910, expanding in the 1920s and then being sold to Domtar. But, when did Irwin Toy move in? I am not 100% sure… Domtar took over Hinde and Dauch in 1962, Arnold Irwin became president of Irwin Toy in 1965, and Irwin went public in 1969. With all of that action in the 1960s, I am guessing the the building changed hands sometime that decade. 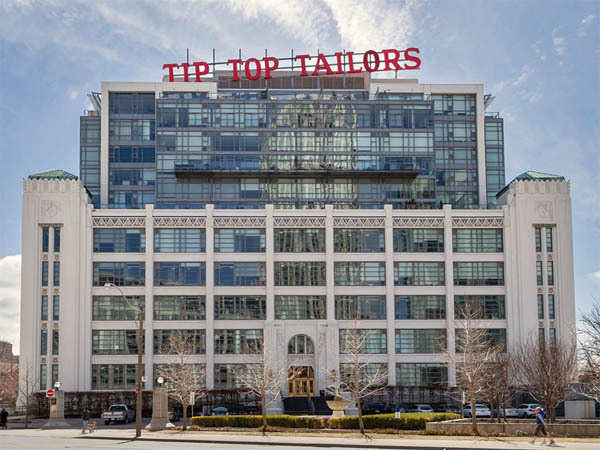 The company (that became Irwin Toy) began in 1926 as an importer and distributor of dry goods and clothing, located in Sam and Beatrice Irwin’s house. 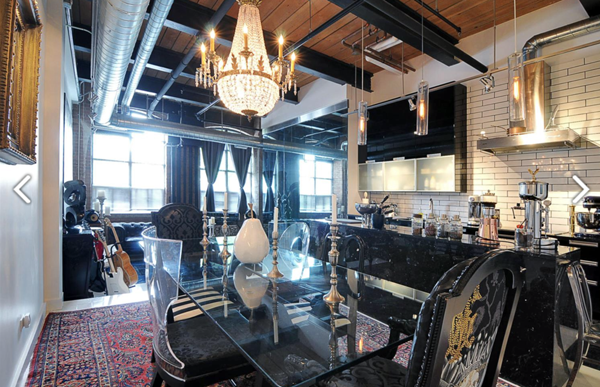 Later, the company moved to a warehouse in the west end of Toronto and began to focus mainly on toys. Sam and Beatrice’s sons took over management in the years to follow. Contrary to popular belief, Irwin did not actually make the toys. The company did not develop its own products but would buy the licenses to sell toys that had proved popular in other countries. 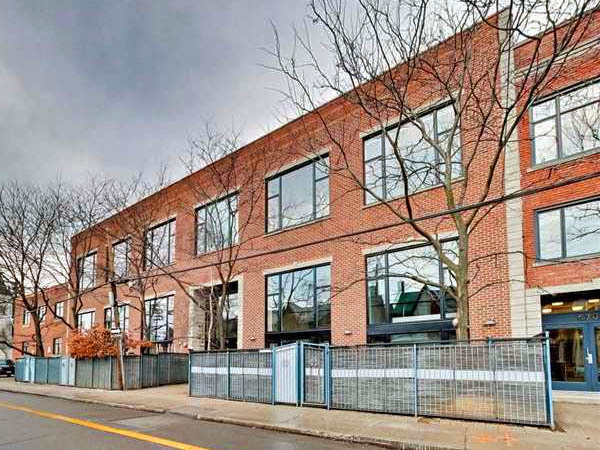 The big industrial complex at 43 Hanna Avenue would have been offices and warehousing, a distribution centre. Not a toy factory. 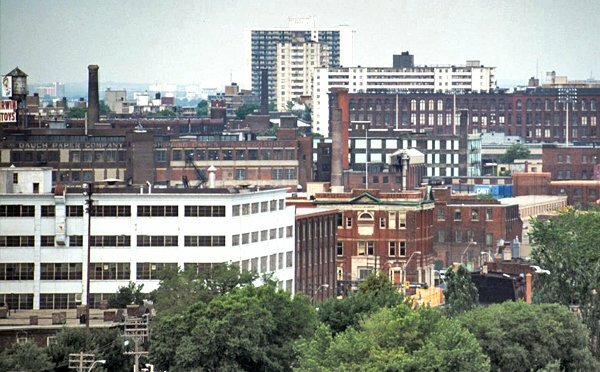 Great shot across what became Liberty Village. 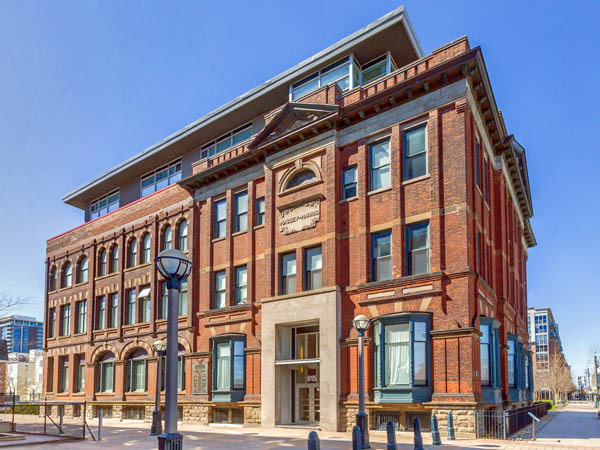 You can see the Massey-Harris head office, the Carpet Factory, and more. Most of Irwin’s profits came from distributing other (usually American) companies’ toys. Almost all popular toys available in Canada until the 1990s were distributed by Irwin. 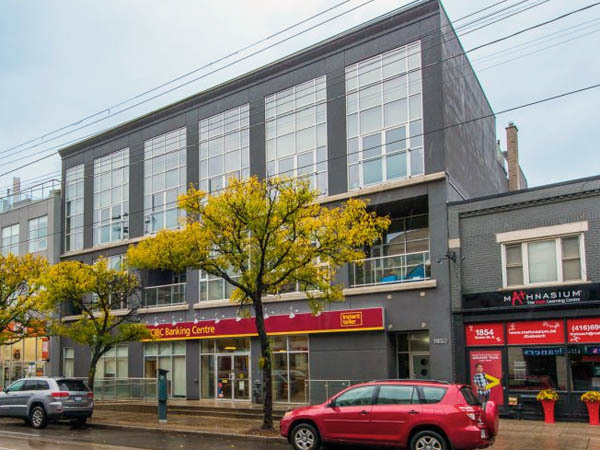 Major American companies wished to sell their toys in Canada, but did not open Canadian branches because of the lower population and tariffs which would generate less income. Irwin’s success came mainly due to their licensing and contract manufacture of American companies Kenner (yeah for Star Wars!) and Parker, where Irwin was the Canadian importer and distributor of their products. 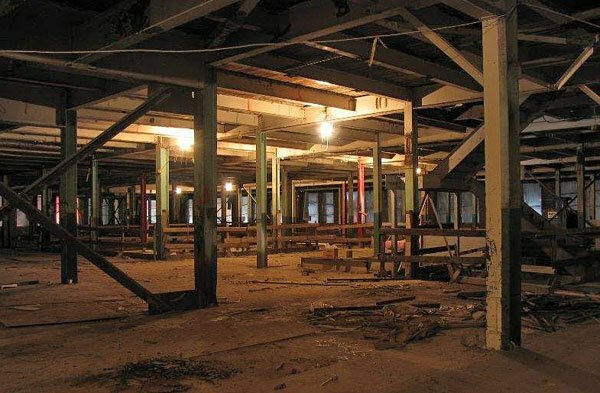 It is amazing how well the building cleaned up! The business found success with the help of the Hula Hoop, Slinky, Frisbee, and later on in the century with the popular Star Wars action figures, Care Bears and the Easy-Bake Oven. In the early 1980s, the Atari Video Computer System was a success, and Irwin was the Canadian distributor. Irwin would also acquire the rights to the Sega video game brand in Canada later on. Video game sales helped fuel revenues of $100 million and growth for the company. They had 350 employees at the Hanna Ave. facility at this time. 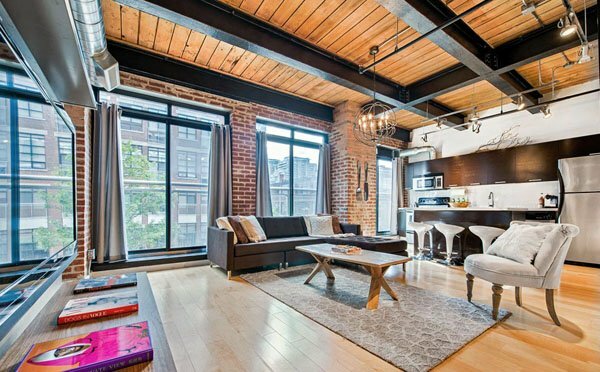 I doubt the Toy Factory Lofts looked this good when they were storing toys in it! During the 1980s and 1990s, major American companies such as Hasbro, Mattel, and Kenner acquired many of the companies that Irwin did business with. Then with the introduction of NAFTA, it became less expensive for American companies to form Canadian branches. Irwin lost many business deals and major toy companies began to distribute toys themselves. 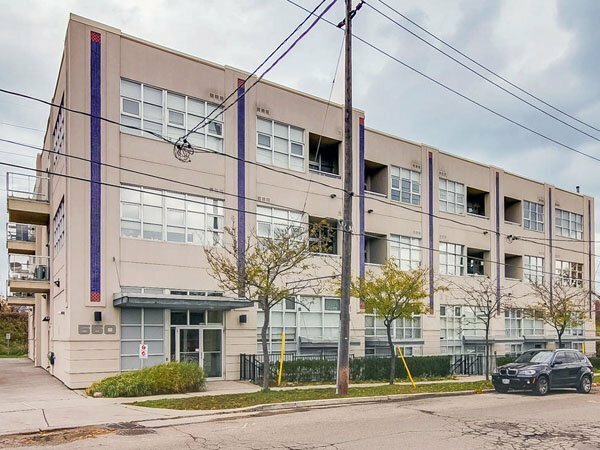 As Irwin Toy faced financial and business difficulty, the company was sold to a private investment group – LivGroup Ltd. of Toronto – in 2001 for approximately $55 million. 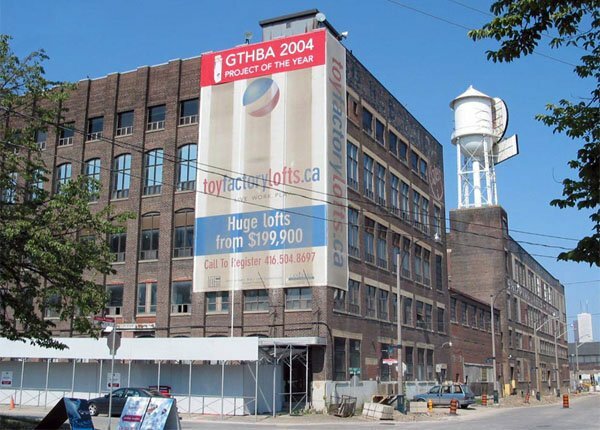 The big old warehouse at 43 Hanna was vacant from 2001 until 2003 when the new owners declared bankruptcy and liquidated everything, selling the old factory/warehouse for $10 million to Lanterra Developments. 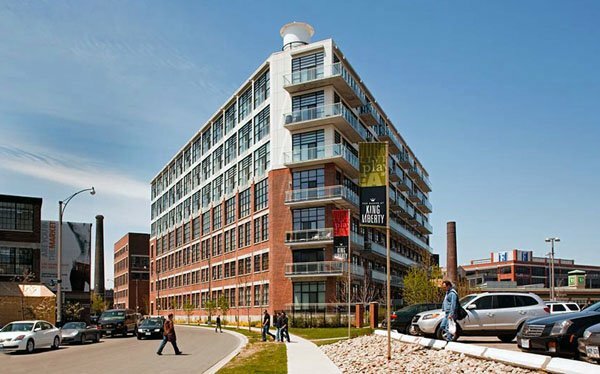 A year or two later, they launched the Toy Factory Lofts, which were finally completed in 2008. 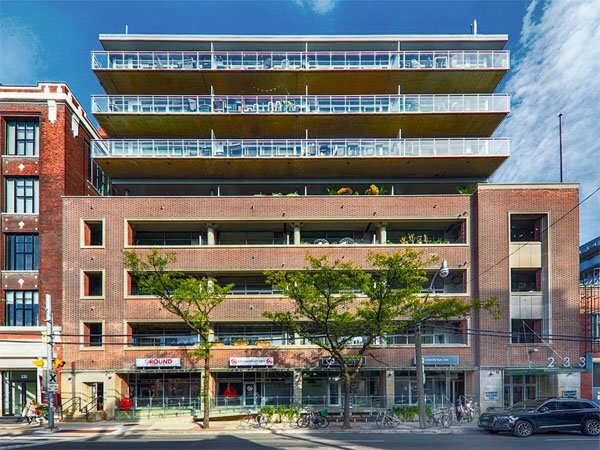 The portion of the building in the poorest shape was demolished and rebuilt to accommodate four levels of parking above grade. 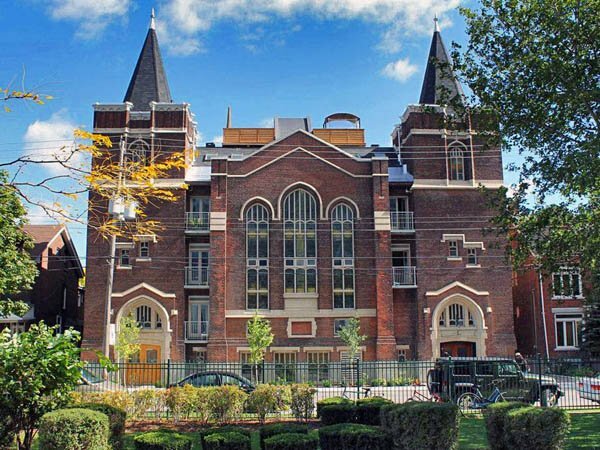 A three-storey addition was constructed on top of the easternmost section of the structure. 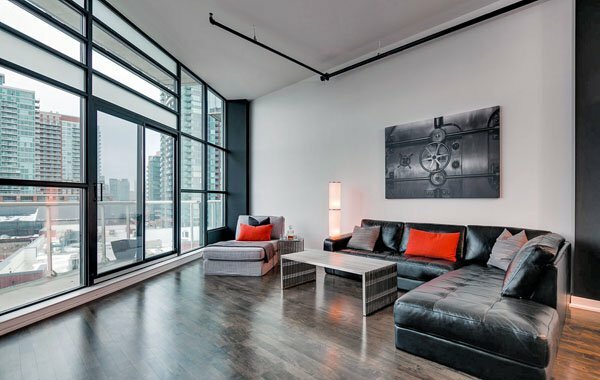 The project was recognized with the 2005 Condominium Project of the Year Award by the Greater Toronto Home Builders’ Association and was honoured in 2009 with a Toronto Urban Design Award for Mid-Rise Private Building in Context. N.B. 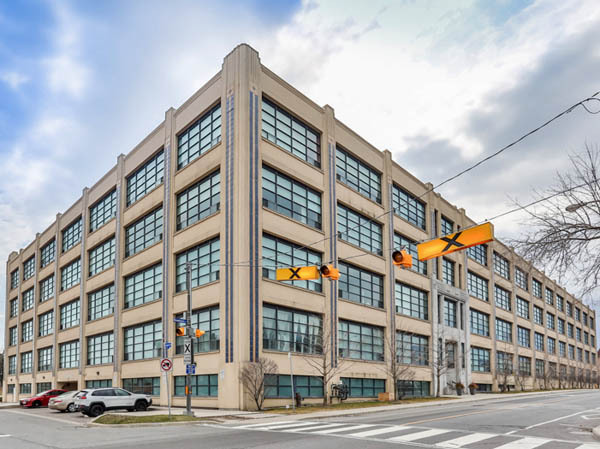 Another neat tidbit – when Lanterra Developments’ president Barry Fenton was a youngster, he and his dad would often visit the Irwin Toy Factory on Hanna Ave. in Toronto to buy miniature cars. 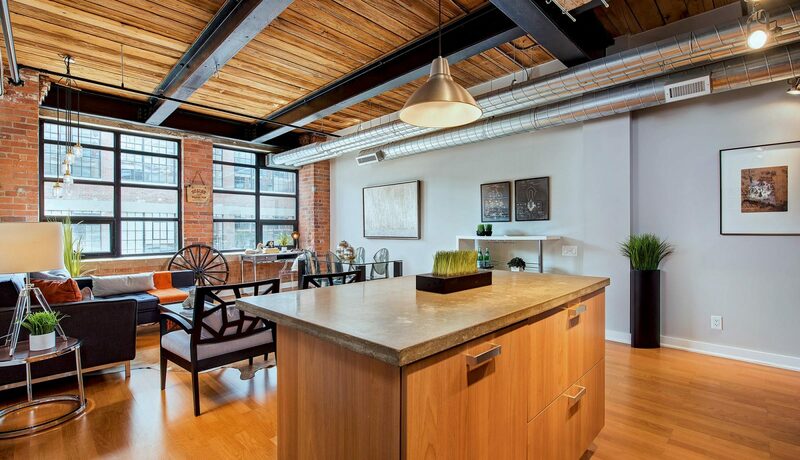 Liberty Village is located on one of Toronto’s oldest settlements. 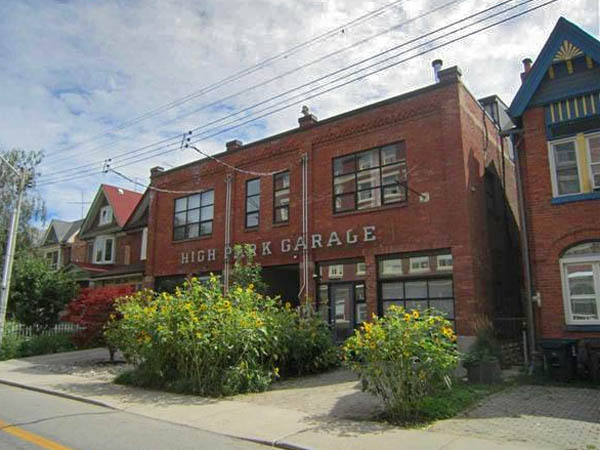 Originally an industrial area, it flourished in the 1920s thanks to proximity to the railway tracks as well as a plentiful labour force from nearby Parkdale. 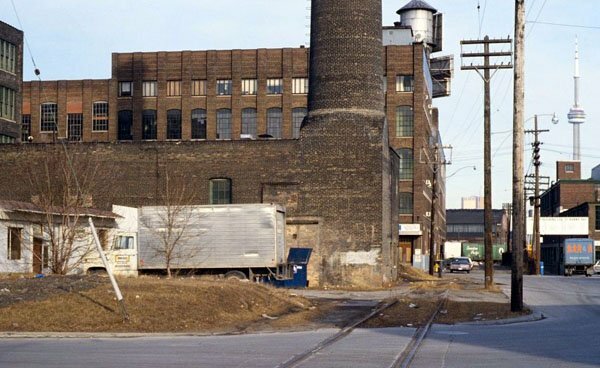 In the late 1970s and early 1980s manufacturing operations within Liberty Village began to decline and the decreased industrial activity along with lower property values caused many buildings to fall into neglect. 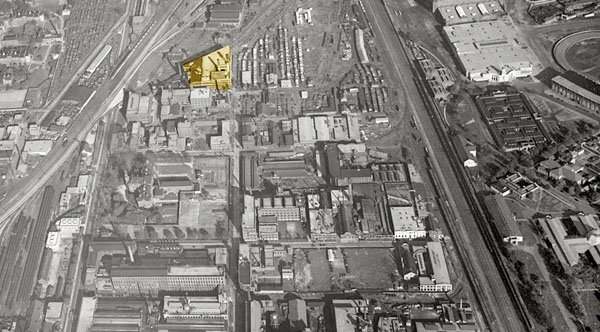 Anyone who spent time in the area in the 1980s remembers the area for the massive Massey-Harris complex as well as Inglis’ huge factory. Little-known is the fact that industry grew in the area because of the proximity of both the Mercer Reformatory and the Central Prison. With a ready supply of free and/or cheap labour provided by the prisoners, it was cost-effective for companies to locate in the area. 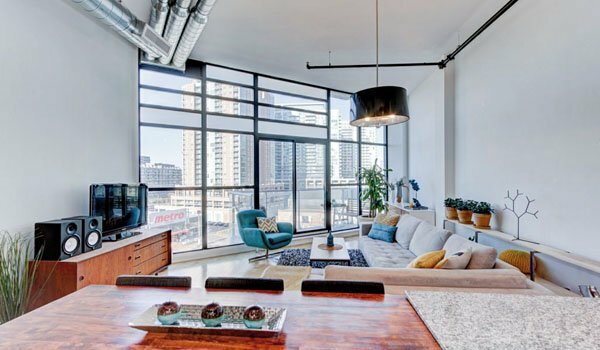 As the factories moved out, condo developers moved in. 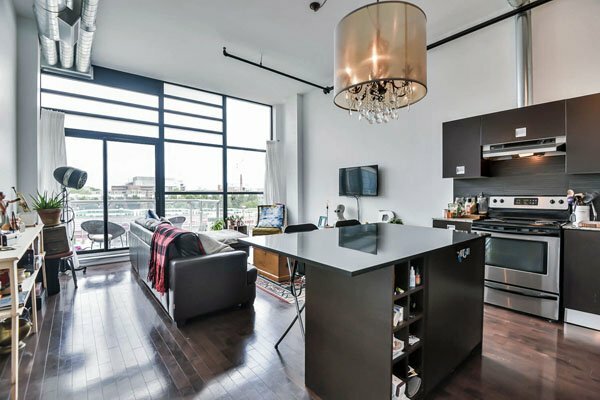 And as the ongoing gentrification of downtown Toronto pushed farther outwards from the core, Liberty Village has become one of Toronto’s best neighbourhoods for young professionals, artists and creative types. 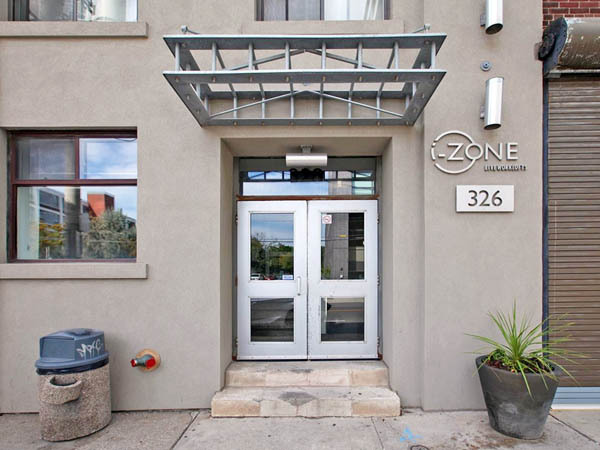 The neighbourhood combines high-rise condominiums, mid-rise buildings, and townhomes with retail spaces for cafes, restaurants, shops and cultural places such as art galleries and offices, while still maintaining its historic roots with the preserved tall chimney smoke stacks projecting from the old buildings now serving as the neighbourhood landmarks. 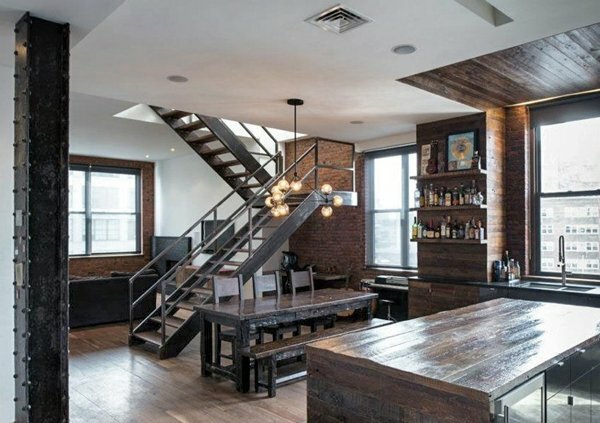 The gritty and urban feel to the area remains. 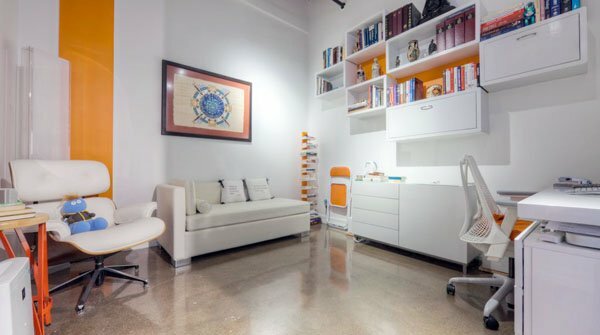 Especially with some of the other old warehouses converted into cool offices attracting many know tech and film production companies. 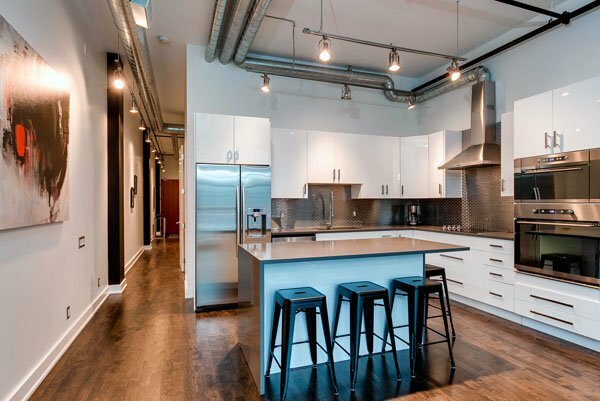 Liberty Village also has amenities like a 24-hour Metro grocer, LCBO and Beer Store, a 24-hour Goodlife Fitness, as well as many other shops, restaurants and bars nearby – meaning residents don’t have to go far to get the conveniences of city living. 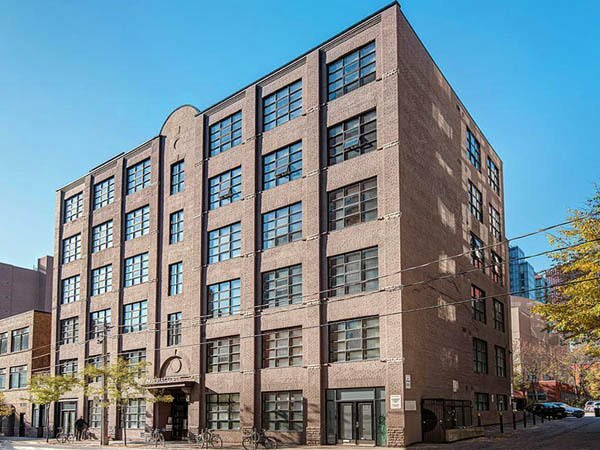 Current Toy Factory Loft Listings.